ANNOUNCEMENT: If your Pottermore username begins with an I, J, K, or L and you submitted your name prior to April, please read this message. Also, the backlog of submissions is rather extensive, so the wait period is 2-3 weeks until such a time that we catch up. 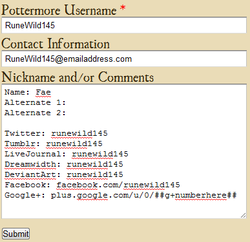 This site is devoted entirely to tracking the names and contact information of Pottermore’s Gryffindors. If you have been sorted into Gryffindor, please send in your (complete) Pottermore username, nickname of choice, and social networks. Also, please do not submit anyone else's information without prior permission. If your name has been added without your consent, please contact us to have it removed. We’d appreciate it if you check The List before sending in a name to avoid repeats, but we will inform you if the name you want is no longer available. Even if it's not on The List yet, it could have been claimed by an email waiting in backlog. We suggest giving three nicknames listed in order of preference, just in case. And remember, it’s first come, first serve! So be creative, but be quick about it. We ask that you leave some means of contact so that we may send a note to let you know you have been added or that the name you want has already been taken. Worry not for your email address will be confidential! As soon as we have updated you on the status of your nickname, your address is deleted. If you don’t want to share that information, that’s fine. Just check The List every once in a while to see if you have been added. We also post rejected submissions on our Twitter when there's no direct means of contact or when our owls fail to deliver a message, so be sure to check there if you haven't heard from us. If there's been a mistake or you wish to change your name, you can resubmit it below. Also, please keep in mind that this is a PUBLIC website, so any information shared here will be visible to ANYONE. Please refrain from using symbols and emoticons beside your nickname in your submissions. We will not accept names like "Harry$". Symbols and emoticons are not always immediately recognized as part of the name and are dropped in conversation more often than not, and that makes matters confusing and bothersome. Once your nickname has been decided, you may add flourishes to your signature as you please. Thank you for your cooperation, and we appreciate your patience as we try to answer all submissions and comments in as timely a fashion as we can manage. In the meantime, be sure to check out the Links page to find out what our fellow wizards are up to. You won't want to miss out, for there are quite a few of the creative and talented among us.